The Act Of Killing, a documentary by filmmaker Joshua Oppenheimer, executive-produced by Werner Herzog and Errol Morris, encapsulates years of Indonesian genocide, suffering, and repression into the story of one its most lethal and efficient killers, Anwar Congo. In 1965, when the Indonesian government was overthrown by the military, Anwar and his ragtag group of friends were promoted from small-time gangsters who sold movie-theater tickets on the black market to death-squad leaders. Fueled by alcohol, ecstasy, and whatever other mind-altering substances they could find, Anwar’s gang helped the army kill more than 1 million alleged Communists, ethnic Chinese, and intellectuals in less than a year. Oppenheimer documents an elderly, demon-infested Anwar, as he and his old friends re-enact their brutally callous murders. Recalling a real-life Ben from the 1992 mockumentary Man Bites Dog, Anwar is a simultaneously charismatic, wounded, and terrifying subject. The Act Of Killing opened July 19 in limited release. The A.V. 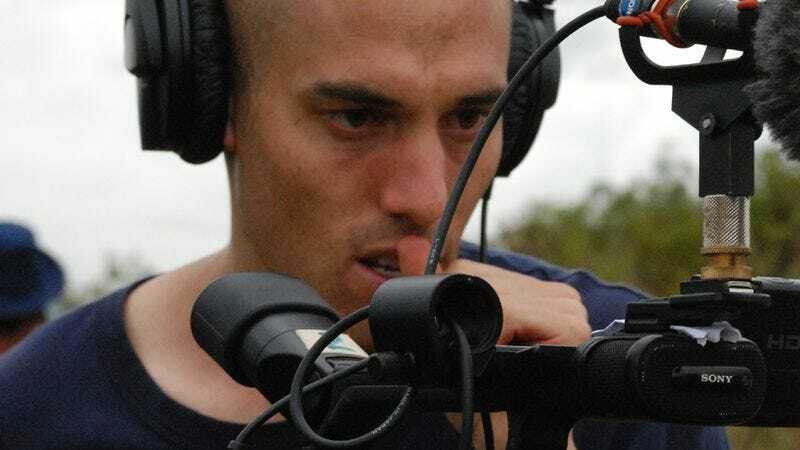 Club: When did Joshua Oppenheimer and the film enter your life? Were you immediately committed to getting behind the project? Werner Herzog: I was not committed at all, but the scenery was kind of strange. I was just leaving for the airport in London, and was at the cafeteria in the hotel. The producer André Singer, with whom I had worked, said to me, “There’s a young man who desperately wants to meet you.” I said, “Well, I have to leave in 10 minutes. Bring him in.” Joshua showed up only with a laptop. He opened it, and showed me only eight minutes of random footage from his film. I immediately knew this was something big. It is so big that I’ve never seen anything like this. So we stayed in touch, and that’s how I got into it. AVC: When did you first become interested in the Indonesian genocide? It takes passion, bordering on obsession, to make the leap to documentary. Joshua Oppenheimer: I came across the Indonesian genocide in 2001, when I found myself making a film in a community of survivors. They were plantation workers, and it turned out they were struggling to organize a union. Their biggest obstacle was fear, because they were afraid of being accused as Communist sympathizers like their parents and grandparents had been, and therefore would be killed for it. That was how I came across the genocide. I found that every time we filmed them talking about what they were afraid of, we would get stopped by the military, arrested, and have stuff taken. Meanwhile, the survivors I was filming—and I didn’t go there knowing they were survivors—would ask if I would go and film neighbors of theirs who they knew had been perpetrators, and thought might have information on how their loved ones had died. For example: “Could you go and find out if my mother was killed? She disappeared 40 years ago, but we never knew what happened.” I would go on these terrible missions on behalf of the survivors, and find out that not only could I get information on how people died, but I could find out in general how the killings had happened, which is something no one had known about before. The perpetrators were boastful. I didn’t have to lure them to open up. I simply asked these men, “What did you do for a living?” In minutes, they would open up and boast about what they had done. It dawned on me that I had walked into Germany 40 years after the Holocaust, and found the Nazis still in power. I realized this was a horrible, but not extraordinary situation, in the sense that everything we buy is made in places like this. The situation demanded everything that I could give to it. AVC: Did you read that boastfulness initially as veiled menace? JO: I don’t think I personally thought of it as veiled menace. Anwar was the 41st perpetrator I filmed. I traveled across the region and worked my way up the chain of command to film every perpetrator I could find. The government knew that if there were all these perpetrators boasting in the communities, they would become these kind of feared prophecies of the state. If you look at the first scene, with Anwar dancing on the roof, he says he’s a good dancer, and just before that says that he’s drinking and taking drugs to forget what he did. His conscience is present from the very beginning of the film. He did this, he got away with it, and as Adi [Zulkadry, leading founder of the paramilitary group Pancasila Youth] says in the film, “Killing is the worst thing you can do. But if you’re paid well enough for it, go ahead and do it.” Then, you must make up an excuse so you can live with yourself. The government gave them an excuse in the form of propaganda, and they’ve clung to that excuse ever since for dear life. The paradox of the film is that what appears to be a sign of a lack of conscience, or lack of remorse, as seen through Anwar, is the opposite. It’s a sign of humanity. It’s a sign that he knows what he did was wrong, and he’s trying to avoid thinking about it and recognizing it. The tragedy is that once you’ve corrupted yourself by killing one person and [getting] away with it, then it’s justified. But you don’t believe the justification because you know it’s wrong; you become more strident, and the justification spills over into celebration. The celebration is a sign of your humanity in a perverse way. It demands that you commit further evil because now you have to suppress the survivors so they don’t demand revenge and don’t challenge your version of events. Then you can extort them and steal their land. You can shake them down in the marketplace, all of which you see or hear about in the film. If called upon, you have to kill again, because if the government says, “Now kill these people,” for much the same reasons, if you don’t do it, it’s tantamount to admitting it was wrong the first time. I think the justification is a way for Anwar to run away from his own pain, and motivates every single embellishment that Anwar proposes. So when people ask, “How did you get the idea of making these surreal dramatizations?” That all came from them organically, as you see in the film. Anwar’s reaction to these scenes was that it was wrong. In that sense, his conscience is the motor and the fuel for his process. It’s not surprising that by the end of the film, the re-enactments themselves have become the prism for which he’s forced to recognize his own broken self. AVC: The killers come with smiles. On a gut level, beyond the history, is that what unnerved, and continues to unnerve you? WH: It doesn’t unnerve me, but it does unnerve some of the reviewers who are expecting a self-righteous, politically correct, castrated version for American television. I personally am not unnerved because I’ve been in very close contact with murderers on death row. For me, none of them are monsters, although their crimes are monstrous. They are monstrous beyond all imagination in some cases. However, meeting the perpetrators makes it obvious that there is no monster. They are still human. They are still very, very human. We have to somehow accept that within the boundaries of humanity, crimes of that magnitude are still possible. They are not completely exotic. They’re not foreign to human nature. That’s a hard thing to swallow. AVC: Did the Indonesian government fund the re-enactments for their own movie? JO: They’re not making their own movie. Long before I met Anwar, I was filming perpetrator after perpetrator showing me how they killed, in the same way that Anwar does on the roof at the beginning. They would take me to the places they killed and show me how they did it. I was saying to them, “You participated in one of the biggest killings in human history. Your whole society is based on this, and your lives are shaped by it. You want to show me what you’ve done, so show me in whatever way you wish. I will film the process and your re-enactments, and create a documentary that shows what it means to your society, and how you see yourself.” I expected to make this broad, kaleidoscopic film with different perpetrators. I lingered on Anwar because his pain was close to the surface. It was an attempt by me to understand their openness. It was not a lure to get them to open up. They were only making scenes for The Act Of Killing. They knew that, but viewers forget it because they’re so into what they’re doing, and so invested in these re-enactments, which is great. If they weren’t invested, it wouldn’t reveal anything about them. They take ownership of it, so it feels like they must be making their own movie. There are pieces of information throughout the film that tell us otherwise. There’s no narrative thread that connects scenes. It would have been very cumbersome to try and look after my film, and help them produce a feature film at the same time. All of the scenes were funded by us, because they were only intended to be in our movie. The sound studio is an Indonesian state television soap-opera studio, and they donated the studio for the purpose of the film. The political gangsters in North Sumatra dominate Indonesian state television. AVC: Some of the production values were so high that it seemed like it was government funded. JO: Some of it was high—and there are scenes where they have their own crew, and the production values look awful. The severed head, and the terrible prosthetic makeup. The acting was always terrible in those scenes. The nightmare sequence where Anwar can’t say the simple line, “I thought I killed you,” because he’s so nervous with the crew, he’s not able to act from a script. Then there’s these really strong scenes where he goes deep into his pain and emotions. I think, [for] the scenes with high production values, we became his crew. I gave myself two rules: One was that I would always see Anwar as a human being, and not as a monster or psychopath. The other was that I would do everything I could with our very limited crew, this small documentary crew with no real experience in fiction. We would do everything we could to make his scenes tailored in a way that spoke to his wishes, and also as powerful and cinematically strong as possible, to make manifest the story and fantasy that he has of himself, by which he copes with the things he’s done. I think there’s a very important consequence to the high production value, which is that those fiction scenes are a greater truth then the observational documentary footage of the making of their scenes. Over time, in the last act of the film, the fiction scenes start taking over the film’s form, and it stops really being a documentary at all, and becomes a kind of fever dream, where we are subjected to a kind of second-hand, third rate, yet beautiful and terrible fantasy of Anwar’s, one after the other. We see that Anwar and society move from one lie and story to another so that it can cope with this trauma and live with it. AVC: That’s a very Herzogian way of looking at a documentary. That a fiction can tell a greater truth. JO: Yeah, I think so. Like Werner, I think I’m someone who doesn’t have any particular commitment to being a documentarian. My background is in filmmaking, and my mentor is Dušan Makavejev, who combined fiction and documentary. What I’ve always been most interested in is exposing the way stories and fantasies reconstitute our everyday reality. What appears to be non-fiction is not only totally mysterious, unfathomable, and strange when you really look at what it is. It’s also the way we cope with that strangeness, and live with it. Telling ourselves stories that we forget that we’re telling so that we can make sense of an inscrutable reality. AVC: As executive producer, how involved were you in the finished product? Were you involved in editing? WH: Well, how can I say—yes, I was involved in editing, but mostly I was an advisor. Joshua would come back again and again with different versions of things, questions and doubts sometimes, and I would advise him. More than anything, I would encourage him. “You have footage that is so unprecedented, so surreal, so incredible that you will never see anything like it again. Don’t be a coward now and cut it out.” At the end of the film, I gave him courage and said to him, “If you don’t put the end in there, you have lived in vain.” He heard me, and what happened was he asked me if I could accept to be in the credits in the film as “Special thanks to Werner Herzog.” A few weeks later he said, “You’ve had such enormous input and encouragement, would you accept being named executive producer in the credits alongside Errol Morris?” who probably had less input than I, but whatever. [Laughs.] I said, “If it is helpful toward the film, I will agree.” I have no personal vanity about being in the credits. However, I’m proud of it now because the film is so powerful, so frightening, and so surreal that it will take decades until you see something of that caliber again. It just doesn’t happen very often. AVC: Do you think Anwar and his gang would have become murderers without the government green light? WH: That’s a difficult question I can’t answer because I do not know Anwar, nor had I been around the situation at the time. Apparently, the political climate and the regime of Suharto [the Indonesian dictator from 1967 until his ouster in 1998], and a vast section of the people in Indonesia, somehow welcomed it. It was not only political figures, but a general climate. AVC: The film has been shown in Indonesia, correct? It’s hard to imagine the Indonesian government taking it very lightly. WH: I do know that the film has been shown in Indonesia, and created a huge shockwave. I see a parallel in this case with Marcel Ophüls’ film The Sorrow And The Pity, which opened the eyes of the French that not all of France was in resistance, and not all of France was against Nazis. There’s a huge segment of the population that collaborated with the Nazis, and it had a huge ripple effect throughout France. This is a similar film, but try not to see under only these aspects. This film is much, much deeper and much more powerful, and much more disturbing than just a political film. There’s realism in it that could never have been dreamt could be possible. It is frightening beyond anything you have ever seen. Don’t look at the film with a straw that you get for your soft drink. AVC: Do you empathize with Anwar and the gang? Were they essentially pawns who saw too many movies? JO: I don’t think they saw too many movies, in the sense that they were first killing without watching movies. They were killing busloads of people by the riverbank and cutting off heads. They were drinking so that they could distance themselves from the act of killing. I think that the message of the film is much more about the role of escapist fantasy than it is about movies. I do empathize with Anwar. I wouldn’t say we’re friends, because each of us was working out much bigger projects throughout the making of the film. He was working out his own pain, and I was trying to expose a regime of impunity for Indonesians themselves. As with the child in The Emperor’s New Clothes, a film would point to something that everybody already knew to be true, and express it so powerfully and emotionally that people would not be able to pretend that they didn’t know it anymore. Thereby, create a face for a whole country to start talking about its past in a different way. The film has really transformed how Indonesia is talking about this. I may not feel friendship with Anwar, but I feel a love for him as another human being. Anwar was absolutely human, and so was his whole gang. That doesn’t mean he’s not responsible for what he did. I’m also not a judge. The role of the artist is to not be a judge. AVC: Is The Act Of Killing a film you wish you had personally made? Is it a film you could have made? WH: No. Neither could I have made it, nor do I wish I had made it. I’m glad and proud that there’s a phenomenal talent out there, Joshua Oppenheimer, who comes out of nowhere and steps out with a great masterpiece.